Ginza Bricktown occupies an oversized place in the history of modern Japan, let alone the urban history of Tokyo. The common historical narrative of Bricktown is hard to resist, as it seems so fitting, so instructive, and so perfectly comprehensive: the Ginza Fire of 1872, it goes, fortuitously cleared a perfectly-located tabula rasa onto which a Meiji government intent on jumpstarting Japanese modernization constructed a Western-style district for the new capital that would impress foreign powers with Japan’s progress and assist in the revision of the unequal treaties. Just as the Meiji emperor himself was re-dressed in the new clothes of a modern monarch, as it were, the Shogun’s city of Edo would be re-cast with Western built forms as the Emperor’s modern metropolis of Tokyo. And Ginza was ground zero. In this way, Bricktown was a “showcase” for the new Meiji government, the new Tokyo, and the new Japan. Part of the allure of this narrative, to be sure, lies in its simplicity and its apparent accuracy. What better way for the Meiji government to demonstrate to watchful Westerners the modernity of Japan than an urban space that looked unmistakably Western? Or the permanence of the new Meiji regime to the people of Japan than a solidly constructed capital city built in foreign architectural forms? Or, for us as educators and scholars of Japan, the intensity and reach of Meiji-era reforms to our students and readers? The evidence is undeniably there. The central government quickly intervened after the fire to prohibit reconstruction of traditional buildings and in their place erected Western-style brick buildings designed by a foreign engineer, Thomas J. Waters. Laborers paved streets in the most up-to-date macadam surfaces and laid bricks on the first sidewalks in the city. Trees provided protection from sun, wind, and rain, with gas – and later electric – lamps making for a pleasant evening stroll. If all had gone according to plan, Bricktown would have continued to grow, consuming neighborhood after neighborhood as improvements spread to adjacent districts, slowly transforming the built environment of the entire city, just as the Meiji government was then revolutionizing Japan. Graphic artists like Utagawa Kuniteru II and Utagawa Hiroshige III likewise quickly adopted this view, producing prints depicting Bricktown as a bustling, foreign commercial district that colored popular views of Ginza and have illustrated many a classroom lecture on the Meiji Period ever since. The 1874 Kuniteru II triptych in Figure 1 is typical. Fig. 1. 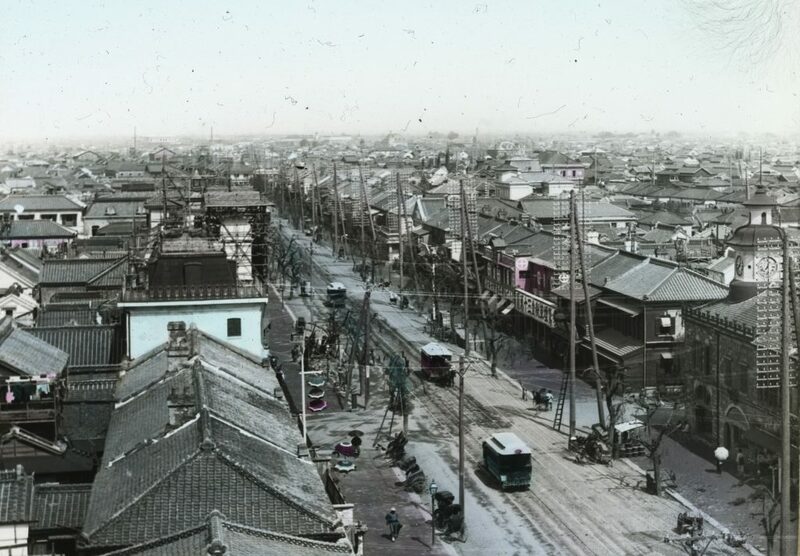 Kuniteru II, “Scene of the Thriving Merchants in Brick Houses and the Blossoming of Peoples of All Classes between Kyōbashi and Shimbashi.” Source: University of British Columbia. Library. Rare Books and Special Collections. Asian Rare-6 no.L3:9. (Click to enlarge, or visit source here). The eponymous brick buildings line either side of a street bustling with traffic of all kinds and sidewalks thronged with pedestrians, protected from the mayhem only by verdant trees and cherry blossoms. The buildings appear to be uniformly two stories tall and stretch into the distance as continuous rowhouses. Their designs are entirely Western: stone plinths and quoins accent the building foundations and edges, colonnades of the Tuscan order replete with entablature support second story balconies, and the tiled mansard rooftops feature parapets ornamented by lanterns and crenellation. The windows appear to be stained glass. Halfway down on the right appears what looks to be a classical pediment. Hiroshige III’s 1874 treatment in Figure 2 gives much the same impression, with a more detailed view of a single building and only slightly less chaotic street traffic. Fig. 2. Hiroshige III, “Famous Places in Tokyo: Brick Merchant Houses on Ginza Main Street.” Source: University of British Columbia. Library. Rare Books and Special Collections. Asian Rare-6 no.L3:7. (Click to enlarge, or visit source here). The overwhelming feeling we are left with from both of these prints is the bustling prosperity and “modernity” of the scenes. Both artists crowd their prints with what would have been widely recognized as symbols of advanced material civilization at the time: Western-style buildings, horse carriages, parasols, Western dress, tophats, and rickshaws, an invention of the 1860s. Both present views of urban modernity one might expect to see on Regent Street in London, or maybe on the Champs-Élysées and Rue de Rivoli in Paris, just as Hattori Bushō described. Aside from the built forms, more importantly, the artists depict Ginza Bricktown crowded with people. The throngs are not flâneurs out for a leisurely stroll. Instead, they are merchants, rickshaw pullers, carriage drivers, luggage porters, geisha, school children, long-distance travelers, soldiers, and Chinese tourists – a cross-section of all classes of society in Ginza not to kill time but to productively contribute to and witness the commercial vibrancy of the district. In other words, they are a visual representation of “all classes, high and low” uniting to enjoy the mobility, prosperity, and material benefits of “civilization and enlightenment” promised by the Meiji Restoration. The “mixing of high and low” was a common theme for Kuniteru II, who revisited this egalitarian sentiment in another triptych from the same year, titled “Scene of the unending traffic and mixing of high and low, male and female, young and old crossing Asakusa Bridge” (Figure 3). These scenes are given added political significance in the context of the Charter Oath of 1868, which called for the tearing asunder of “evil customs” of the past, such as the Tokugawa ascriptive class system, travel and occupational restrictions, and sumptuary laws. In this way, depictions of a thriving Bricktown swarmed with commoners of all classes enjoying the benefits of reform were both a radical political statement and a suggestion of widespread popular support for not only Bricktown, but for the Meiji project as a whole. Fig. 3. 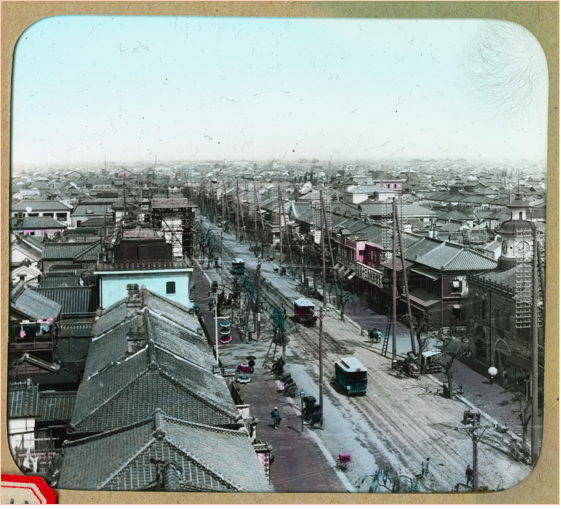 Kuniteru II, “Scene of the unending traffic and mixing of high and low, male and female, young and old crossing Asakusa Bridge.” Source: University of British Columbia. Library. Rare Books and Special Collections. Asian Rare-6 no.L3:7. Asian Rare-6 no.L3:8. (Click to enlarge, or visit source here). With all this in mind, it is tempting at first glance to uncritically accept the easy narrative of Ginza portrayed in the prints, that of Bricktown as the spatial analogue of Meiji modernization or as the tangible manifestation of a Meiji success story. We seemingly have a group of perspicacious, enlightened Meiji government leaders united in their desire to protect and improve Japanese material civilization who benevolently bestowed a pre-fabricated modernity onto the people of Tokyo from the top down. In response, the people, we are to presume, welcomed this gift with open arms, fully embracing the benefits of modernization, the Meiji reforms, and the Meiji government by extension, and worked together with the state, moreover, to advance national goals. Yet, as any architect or urban planner will lament about best laid plans, even the best laid historical narratives often fall apart as they move from drafting to implementation. That is to say, the narrative of Ginza Bricktown is a myth, as imagined as the artistic depictions that inspired it and for so long have sustained its existence. By all indications, the literary and graphic representations of Ginza Bricktown as the wellspring of modernity in Tokyo were more imagined than verisimilar. The photographs in Figures 4 and 5 offer more accurate glimpses of Bricktown, circa 1875. Comparing images shows that, for starters, the buildings themselves were not nearly as uniform in design, or always as Western, as the prints suggest. And they certainly were not always rowhouses, nor even always brick. In fact, Waters, hired two years prior in 1870 as Surveyor-General of Tokyo, had merely drafted guidelines for brickmaking and blueprints for constructing brick buildings as tall as three stories to be erected by the central government. While buildings fronting the main street were required to be built in brick, landowners privately financing their own housing reconstruction had final say over the final design and arrangement of the building, either as a stand-alone machiya or as a ren’ya rowhouse. On backstreets, moreover, owners were free to use any building type they preferred, including traditional plastered dozō-zukuri warehouse style, provided that it was fireproof. Some owners preferred stucco plaster on their exterior walls, others left the exteriors in naked brick. Fig. 4. “Ginza.” Source: Kenchiku Gakkai, ed., Meiji Taishō Kenchiku Shashin Shūran, 15. (Click to enlarge, or visit source here). Fig. 5. “Ginza.” Source: Kenchiku Gakkai, ed., Meiji Taishō Kenchiku Shashin Shūran, 16. (Click to enlarge, or visit source here). Many alterations can be attributed to Japanese craftsmen and laborers tasked with constructing unfamiliar structures reaching into their toolkits for more customary forms and practices. When decorating buildings with ornamentation, for example, builders relied on traditional features and flourishes, as seen in many contemporary examples of giyōfū “pseudo-Western” architecture (For more, see essay by Kanaya Masataka). For this reason, brick building roofs were tiled in the same tiles as traditional ones, stuccoed exteriors took on the appearance of traditional plaster construction, and visitors were more likely to see a karahafu curved pediment over prominent entrances than a classical triangular Greek one. 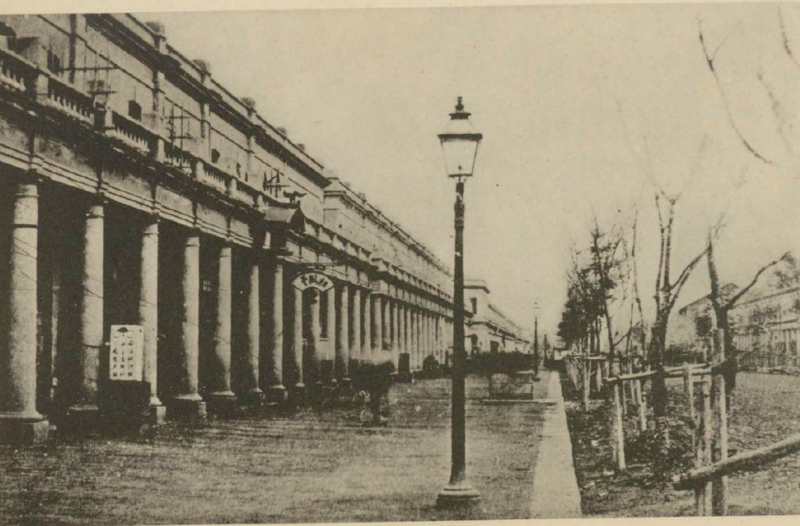 Similarly, engineers unaccustomed to sidewalks or roadside fixtures placed trees and some lampposts directly in the roadbed where they would not obstruct the large numbers of anticipated pedestrians. Fig. 6. “Ginza.” Source: Kenchiku Gakkai, ed., Meiji Taishō Kenchiku Shashin Shūran, 17. (Click to enlarge, or visit source here). And where are all the people? Figure 6 offers a vision of Bricktown architecture that perhaps best fits the imagined visages in the woodblock prints. Colonnaded arcades fronting Western-style rowhouses continue as far as the eye can see. But even here, the storefronts are denoted by Japanese-style signage and pediments. The ghostly figure on the sidewalk, furthermore, is the first sign of life seen in the Bricktown images. While the blurring betrays the long exposure time needed for the early photographic technology, the presence of the figure in this image makes the desertion of Bricktown in Figures 4 and 5 all the more striking. For sure, it was possible to capture people in period photographs (see Allen Hockley’s essay). But nowhere do we see the throngs of commoners, “all classes, high and low” united in flocking to Bricktown. Fig. 7 – “Rooftop view of city.” Source: Museum of Anthropology at the University of British Columbia, James Davidson collection, a03334 (Click to enlarge, or visit source here). An only slightly more lively urban scene appears in Figure 7, a hand-painted glass lantern slide depicting the district circa 1895. Taken from atop the Hattori Clock Tower at the heart of Bricktown, the camera’s eye casts northwards towards Ginza 3-chōme and 4-chōme along Ginza Main Street. Now more than twenty years since the early termination of the reconstruction efforts, Ginza exhibits a mixture of Western and Japanese architectural styles and ornamental elements. Two buildings on the right (eastern) side of the street illustrate the wide spectrum of styles seen in Ginza at the time. First, on the right edge of the image, note the Kyōya Clock Company Ginza clock tower, itself a frequent object of woodblock prints depicting the prosperity and bustle of Bricktown. In addition to the defining clock tower, the building exhibits a number of Western features. The exterior walls are plainly rusticated brick; the rooftop parapets are accented by crenelated ornament. Yet, just a couple doors down the street, the Iwaya Shōkai tobacco store spans three signboard-dominated storefronts that bear little resemblance to the colonnaded rowhouses of Figure 6. Styles in the backstreet areas are even more mixed and confused. Still, the only signs of life are a few rickshaw pullers, a few horse-trolleys, a few pedestrians, and two laborers engaged in what appears to be filling potholes or perhaps sweeping up horse manure from the street. Aside from the retention of traditional building types in Ginza and the absence of people in the images, there are more significant reasons to question the common historical narrative of Bricktown. As we might glean from the images of an almost entirely empty district, Bricktown was not a success. Put simply, the local officials and residents of Ginza were none too pleased about central government intrusion into their neighborhood. Indeed, in their fervor to construct brick buildings, Meiji government officials Ōkuma Shigenobu, Inoue Kaoru, and Shibusawa Eiichi (all in the Finance Ministry) had overruled the opposition of Tokyo Governor Yuri Kimimasa, who had lost his own home in the fire and had argued for the distribution of donated relief funds to aid those who lost property in the fire rather than for financing construction of new brick buildings. The central government had then expropriated lands necessary to widen streets, had condemned traditional buildings that survived the fire, had torn down temporary shelters survivors erected on their burned out properties, and had even evicted area residents, removing them to nearby government-owned land to make way for construction crews. At one point, the central government even threatened “strict punishment” for anybody who publicly defamed the project by “recklessly ridicul[ing] the new construction regulations, and spread[ing] groundless rumors to incite the people.” These are not the actions of a benevolent, enlightened government that has the best interest of the people in mind. In the end, area residents exercised the strongest political statement they could to resist Ginza Bricktown: they voted with their feet and simply refused to move into the new brick buildings. A report from 1872, for example, gave the status of 324 planned buildings: future tenants had been secured for only 84 of the buildings under construction while the other 49 would sit empty after completion; the remaining 191 buildings would be built when ready irrespective of whether they had tenants waiting or not. 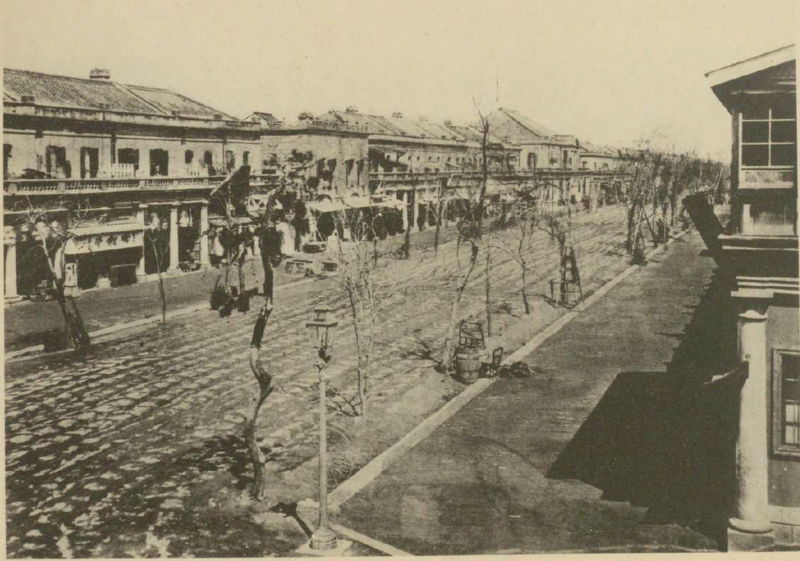 In this way, Ginza Bricktown served as an outlet for popular frustrations with the new government as the residents of Ginza voiced their opposition to not only Bricktown, but also to the autocratic Meiji regime in general. 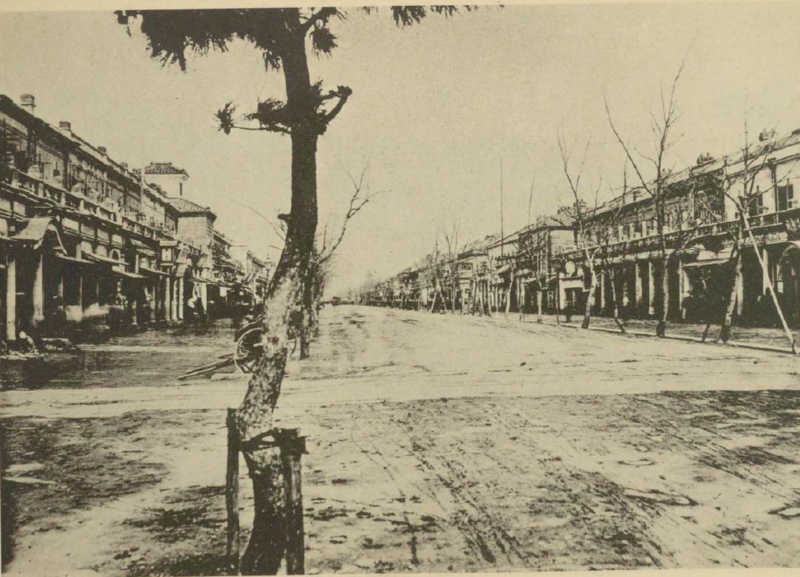 Facing staunch opposition from both local officials and residents, the Meiji government was left with little choice other than to withdraw central government support, cancelling plans to expand brick construction beyond Ginza in 1873, just one year after the project started with such high hopes. So, what should we as educators and scholars of Japanese history make of Ginza Bricktown and the narrative myths that surround it? For sure, Ginza is now a thriving commercial district that draws millions of visitors every year to its many high-end retail shops. But we should be careful to resist too haphazardly drawing a straight line between Bricktown as planned and the current Ginza. After decades of adaptations and retrofitting by local residents, what was left of Bricktown by 1923 was completely destroyed by the Great Kantō Earthquake and the ensuing fires that devastated the city. Prior to that, Ginza was home not to name-brand retailers, but to newspapers and publishers that fostered the People’s Rights Movement (Jiyū Minken Undō) in the 1880s. It was not until the early 20th century that Ginza overtook Nihombashi as the retail center of Tokyo, with the first subway line in the capital bringing crowds of shoppers when it opened in 1927. All the while, Ginza only thrived because local residents modified their surroundings to more suit their needs for housing and retail space. But none of this is meant to detract from the myth of Ginza Bricktown. Indeed, we must by no means disregard Bricktown as a failure, nor too quickly dismantle its place among the narratives of Meiji modernization. For each of the challenges to the myth of Bricktown cataloged above only reinforces its power. Myths are useful. They are created for a purpose. If modernity is a myth, David Harvey notes, it is a myth created in order to differentiate the new from what came before. Certainly the many continuities traversing the supposed fissure between “modernity” and what-came-before call into question the idea of a radical break. In saying that modernity is a myth, however, Harvey’s point is not that modernity is meaningless. Instead, “If modernity exists as a meaningful term,” he writes, “it signals some decisive moments of creation destruction.” In other words, for modernity to be meaningful, there must be radical human-made transformations to existing social organizations and built forms that gouge the putative chasm isolating the modern from the premodern. In this sense, Ginza Bricktown — a project that demolished the antiquated built forms of the premodern city and in their place constructed the streetscapes of the new modern capital — was above all an attempt to reify in brick and stone the transition between Edo and Tokyo, Tokugawa and Meiji, premodern and modern Japan. It is, in the end, the very myths of Ginza Bricktown that makes it such a powerful symbol of Japanese modernity. If we are looking for a success story in Ginza Bricktown we find it not in a narrative of triumphant top-down modernization or even one of victorious bottom-up resistance against an overbearing state. Rather, it is somewhere more in the middle, a story of urban change as a process of government authorities, business leaders, and local residents working in concert to shape the built environment in response to changing conditions and demands. The lesson of Bricktown for urban planners was that any attempt to unilaterally impose meaning onto the space of the city was bound to spark opposition from local residents. Only actors at all levels of society working together could successfully produce lasting and meaningful urban reform. The lesson for us as historians is that the same was true of Japanese modernization during the Meiji Period. David Harvey, Paris: Capital of Modernity (New York: Routledge, 2006), 1. Henry D. Smith, “Tokyo as an Idea: An Exploration of Japanese Urban Thought Until 1945,” Journal of Japanese Studies 4:1 (1987): 54-55. Ozaki Yukio, The Autobiography of Ozaki Yukio: The Struggle for Constitutional Government in Japan, trans. Fujiko Hara (Princeton: Princeton University Press, 2001), 47. Tōkyō-shi Shikō, Shigai-hen [hereafter TSS], vol. 52, 820-822. The petition can also be found in Tōkyō-to, ed., Ginza Rengagai no Kensetsu, 34. Quoted in Tōkyō-to, ed. Ginza Rengagai no Kensetsu, 148. A woodblock print of Ginza Bricktown even graced the cover of the most famous English-language history of the city, Edward Seidensticker’s Low City, High City. The image was retained when the book was republished in 2010 as Tokyo from Edo to Showa, 1867-1989. Hiroshige III was a disciple of the more famous artist Utagawa Hiroshige of The Fifty-Three Stations of the Tokaidō fame. According to an order dated 1874.4.19, local residents who had no other place to go during construction were authorized to temporarily relocate to Public Works Ministry land in Kobikichō. See National Archives of Japan, “Fuka Kobikichō moto Tetsudō Kyoku yōchi nokorite Kyōbashi inan jūkyonin itenchi to nasu.” Call#: honkan-2A-009.00.tai00336100. 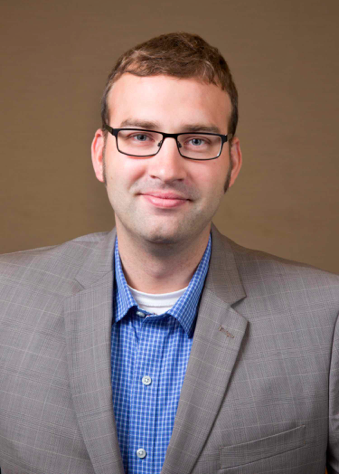 Tristan R. Grunow is Assistant Professor without Review in the History Department at UBC. Previously, he was Postdoctoral Fellow at the Reischauer Institute of Japanese Studies at Harvard University, and Visiting Assistant Professor of History and Asian Studies at Bowdoin College. He is currently completing a manuscript charting the transformation of Tokyo under the processes of Japanese state-formation and empire-building.